As a manufacturer, you know the industry is changing. You’re expected to produce more, work faster and leaner, and find ways to make new products like those comprising the Internet of Things (IoT). Customer and employee expectations are also changing rapidly because our experiences as consumers shape our demands for business. As many factory employees are approaching retirement, a new generation is joining the workforce—a generation that wants the business systems they interact with to be as intuitive as those they use in all other areas of their life. 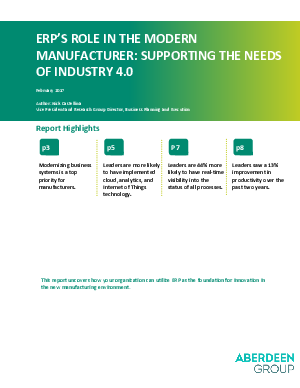 Download the full report to learn more about how a modern ERP system provides the foundation your business needs to innovate and compete in the modern manufacturing landscape.